The best way to protect your RV is with some sort of shelter. If you don’t have some sort of covered area for your RV, a breathable RV cover is the next best thing to protect your RV. 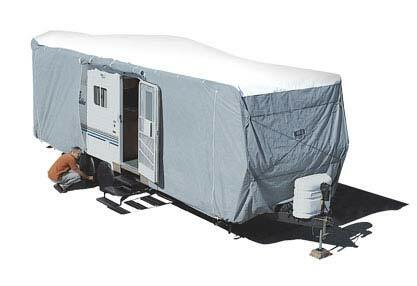 RV covers are ideal for high moisture climates like we have in the East Kootenays. PolyPro or PermaPro fabric top resists and repels rain and snow yet vents inside water vapor out. Prevents mold, mildew and ice buildup. Rugged UV and water-resistant polypropylene fabric side will protect your RV aga inst moisture, UV rays, dirt and bird droppings. Strap and buckle attachments prevent billowing in windy locations and allow for custom look. A RV cover will save you time by reducing the need to wash & wax. A RV cover will protect the resale value of your RV by keeping it looking like new. Many looks to choose from and to closely match the size of your RV.